After successful completion of the postulancy, a woman can be admitted to the novitiate, a period of formation rooted in daily prayer and the Eucharist. 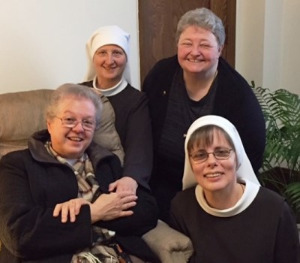 The novitiate is a time of discernment and development that is unique to each woman, blending classroom study, outreach ministry, and personal growth. Novices also have opportunities to meet and interact with men and women in other religious communities who are also in formation. Upon entrance to the novitiate, a woman is given her religious name and bears the title of “Sister”. Each novice also chooses to wear either the Felician religious habit with the traditional white veil of the novitiate or the modified religious habit with no veil. Novices reside in a formation house under the guidance of the Director of Novices. Year one and year two of the novitiate are decidedly unique. The first year, known as the Canonical Year, is a contemplative time as each woman focuses on coursework, prayer, reflection, and a deepening of her relationship with God, community, and self. In the second year a novice continues her classroom study, especially the study of vowed life. She also experiences community and ministerial life by going outside of the novitiate to live and serve in Felician communities across the province.